Bergamo Orio Airport is a relatively small airport with increasing popularity. Low cost airline companies prefer it as it's a lucrative alternative of the much busier (and expensive) Malpensa and Linate airports near Milan. We planned our weekend journey to cover Bergamo and Milan, and if we have time- the beautiful Como lake. That's the reason we went for the option to rent a car. Car hire offices are located on the right hand side of the arrival's exit. Our plane landed in the evening and around 8:30 PM we were at the Auto Europe/Dollar/SicilybyCar office. It's a small office with only one personnel inside opened from 7:30 AM till 10:30 PM. There was another client before us so we had to wait for his documents to be handled first. It took about 15 minutes till our turn came. Our printed voucher and documents were processed quite quickly. The Italian guy behind the desk gave prompt answers to our questions although he wasn't overly polite :-) The best thing he wasn't very pushy on offering us extra stuff. Useful Tip: Bring your own GPS if you have- that will save you a lot and still you'll be able to drive in the foreign land with an ease. Our documents were handled for less than 20 minutes and we went out to catch the car rental parking shuttle that was supposed to drive us to our car. 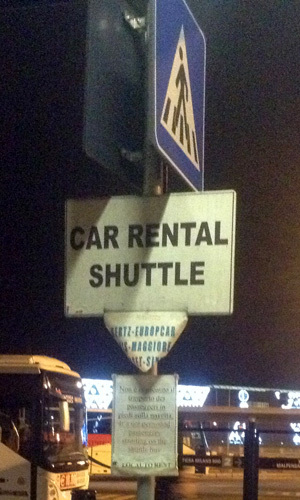 The shuttle stop is just in front of the exit- there is an old small sign pointing it. We waited for about 15 more minutes for the shuttle. At least 10 other people joined us in waiting. The trip to car hire parking was very short. As we would understand later- there's a walk-through passage that leads to the parking (in case you don't have a lot of bags, of course). We found our car easily although it was quite dark (9:30 PM). 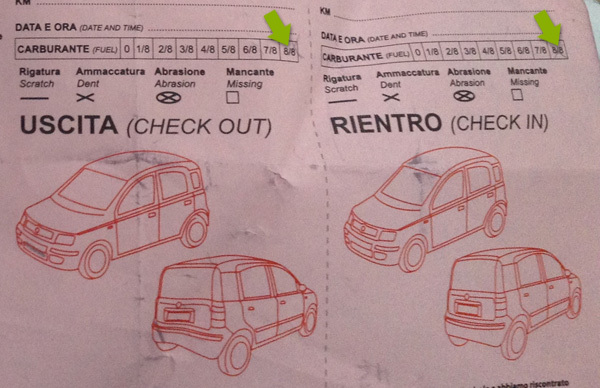 Nissan Micra @ 50,000 km with 2 small scratches, that were diligently marked on the paperwork we got from the agency. It's a good practice to take a photo of your car before getting it as there might be some hidden scratches. I mounted my own GPS and we drove out. Bergamo is not a very big town so we found our hotel quite fast (thanks to that precious GPS of mine!). Bed & Breakfast Ciliegio has some great ratings and reviews at Booking.com so it was an easy choice. The owner, Philippo, welcomed us in the late evening and even managed to recommend us a fine restaurant in the neighbourhood. He was complaining he was still waiting for an Italian (yes, native!) couple who got lost depending on public transport and couldn't manage to the hotel. That was another proof for us that getting a car hire was the right decision. Grotta Azzurra, the restaurant recommended by Philippo, was just a kilometer away. It was full to the brim, we hardy found parking place. (Parking is located in the inner yard of the restaurant- it had at least 60-70 places). Food was very delicious, the "old-school-non-english-speaking" waiters brought in even more charm to the situation- great final for our Italian evening. 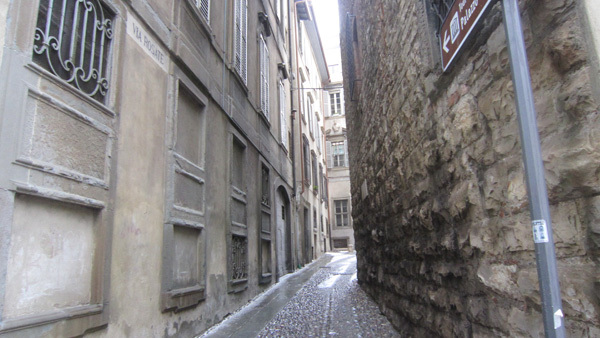 If you happen to visit Bergamo, a must see visit is The Old Town. It's called "Città Alta"- a very charming place. It's better to visit it on spring or summer, not like us in the winter but still- the place is very beautiful. We parked our rented car at the parking, just outside the tall Venetian walls of Città Alta and went on walking. (No tourist's cars allowed inside and there are many streets that are so narrow, that two people could hardly walk shoulder to shoulder). There were a lot of offers for guided walks (starting from 10 euro per person) but we decided to go on our own- feeling confident and prepared enough. 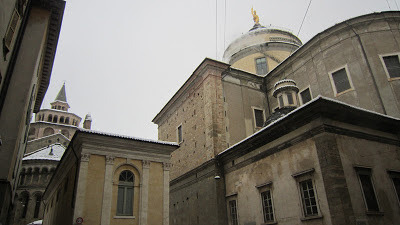 Our journey started at the Piazza Luigi Angelini; we visited the Gombito Tower and some other tower houses. After that we looked around for the Piazza Vecchia and surrounding buildings. We discovered the beautiful Santa Maria Maggiore and the Colleoni Chapel. We had a break at Bar Flora for a ristretto (30 ml of very strong espresso). Refreshed, we went through side streets to the church of San Salvatore. And finally, we couldn't help but testing the famous "funicolare"- a cable railway in which a cable attached to a pair of tram-like vehicles moves them up-down the steep slope. Although it was cloudy and raining from time to time, we had a great time in Bergamo. Once again- we recommend summer time to visit those charming cobbled-stone ancient streets with marvelous churches and cozy restaurants. My next article will describe our visit to Milan- the centre of Lombardia and the main goal of our journey. For conclusion, a few words on returning our rented car. We had to return our car with full fuel tank in the early morning when was our flight. In the contract, the fuel tank was divided into eights- 1/8, 2/8…8/8. I also noticed at the beginning, the Micra fuel gauge had 8 levels when completely full. So the night before return, I filled the tank to the brim and again it showed 8/8. In the morning, we managed to get to the parking lot. A good tip: When getting the car from parking lot, save the exact location to your GPS. That could save you a lot of hassle when returning the car as roads around airports could be very complicated. We were a bit worried if there'll be a shuttle bus that early in the morning (6:30 AM). A guy at the parking lot showed us a direct walking path to the airport and we were about to go on foot when the shuttle bus came. 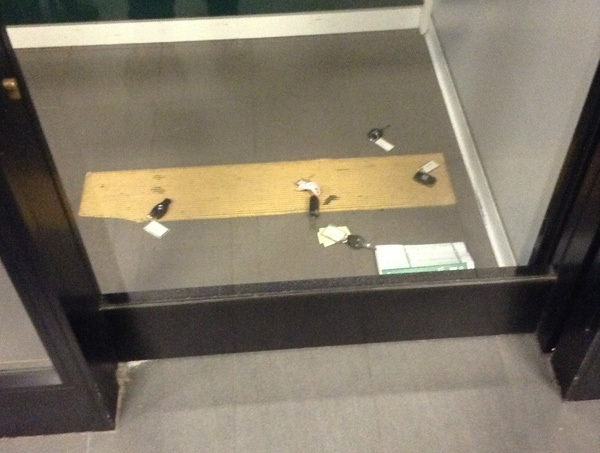 The car rental office wasn't opened at the time of our arrival but there was a hole in the window and a lot of car keys on the floor. So that's what we did- filled our return document and dropped the key and the yellow paper through the hole to the floor. You have to go to Bus Stop 3 directly outside Terminal 1 after exiting the arrivals hall. The bus stop is marked BUS STOP 3 and you take the bus number H1 marked "H1 Holiday Inn (M4)" There is a bus every 20 minutes from 04:42 and from 15:22 every 25 minutes. The bus ticket costs £4.50 single and £8.00 return. The journey time is about 15 mins (it goes via Terminal 3). 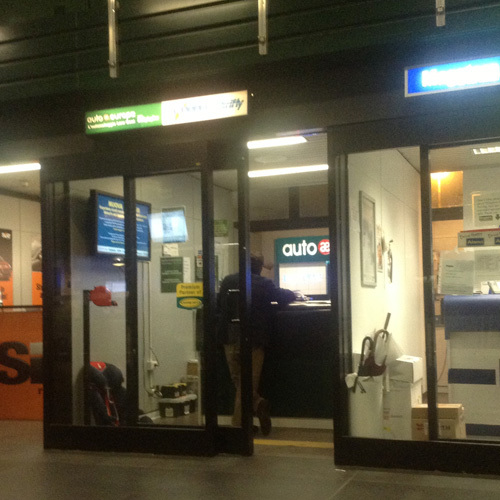 The car rental office of Green Motion had two members of staff. Process time took 15 minutes for the paperwork. The office itself is located in separate building right outside the Holiday Inn entrance. I received a new clean car (about 8,200 Miles). Overall process time takes 30 minutes by time you check over the car. It was a similar experience when I returned the vehicle. Overall time from arriving at the Green Motion office to returning to Heathrow again takes 30 minutes. The bus stops at two other hotels nearby, close to the M4 motorway, but the bus journey itself was only 15 minutes. there is no need to avoid Green Motion as often they are the cheapest option.